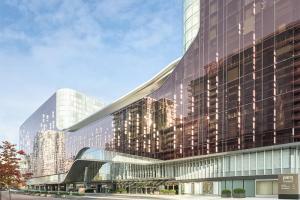 Set against the backdrop of Western Canada's majestic coastal mountains, JW Marriott Parq Vancouver delivers a luxury hotel unlike any other. The hotel welcomes guests with sophisticated accommodation, inspired service and an exceptional location in the epicenter of downtown Vancouver's dynamic entertainment district, Parq Vancouver. Replenish your spirit in the intuitively designed rooms and suites, brimming with amenities. Re-energize at the luxury Spa by JW or enjoy a workout in the modern fitness studio. Enjoy a meal at Honey Salt, whose menu showcases the local ingredients with an emphasis on farm-to-table offerings. This hotel is a half mile from Pacific Center Mall Vancouver, and 6 miles from Vancouver Airport. Stanley Park, Granville Island, Seawall, English Bay, Grouse Mountain, Chinatown are all less than 6 miles from the hotel.